Built around 1120-1150, this is Norway's oldest wooden church. The ridge turret was erected in 1704, and an addition that extended the chancel was made in 1601. The richly carved north portal belongs to an older church and is famous for its ornamentation with ribbon-like boarders and slender, elongated animal forms. This decoration has become known as the Urnes style and dates back to 1050-1100. The columns or «staves» inside the church have cubed capitals with motifs from real life such as elk and doves, but also imaginary centaurs and dragons. More info about Urnes Stave Church. This old merchant quarter is the only preserved business district from the Hanseatic period. It is built in medieval tradition. Finnegården at Bryggen is a museum furnished in Hanseatic style. 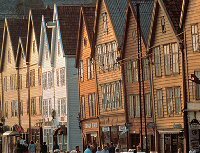 The official Bergen website www.visitbergen.com. A cluster of dozens of islands centred on Vega, just south of the Arctic Circle.. The islands bear testimony to a distinctive frugal way of life based on fishing and the harvesting of the down of eider ducks, in an inhospitable environment. There are fishing villages, quays, warehouses, eider houses (built for eider ducks to nest in), farming landscapes, lighthouses and beacons. There is evidence of human settlement from the Stone Age on. Read more on www.verdensarvvega.no. Situated in south western Norway, northeast of Bergen, Geirangerfjord and Nærøyfjord, set 120km from one another, are part of the west Norwegian fjord landscape, which stretches from Stavanger in the south to Andalsnes, 500km to the northeast. 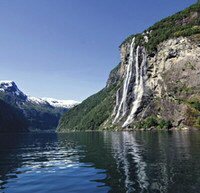 The two fjords, among the world’s longest and deepest, are considered as archetypical fjord landscapes and among the most scenically outstanding anywhere. More info about Fjord Norway. The Struve Arc is a chain of survey triangulations stretching from Hammerfest in Norway to the Black Sea, through ten countries and over 2,820km. These are points of a survey, carried out between 1816 and 1855 by the astronomer Friedrich Georg Wilhelm Struve, which represented the first accurate measuring of a long segment of a meridian. 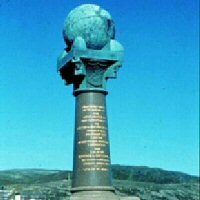 More info on http://www.hammerfest-turist.no/index.php?page_id=51 and the Link to UNESCO: http://whc.unesco.org/en/list/1187.